This page is about the Christian Bible. For the Hebrew one, see Hebrew Bible. The Bible, also known as Holy Bible is a group of religious texts of Judaism or Christianity. The word Bible comes from the Greek word τὰ βιβλία (biblia) which means "books" in English, because it is many books in one book. It includes laws, stories, prayers, songs, and wise words. A number of texts are both in the Hebrew Bible, used by Jews, and this Christian one. The Islamic name for the Bible is the Injil. When talking about the Bible, a book is used to speak about a number of texts. All the texts that make a book are believed to belong together. Most of the time, people believe they were written or collected by the same person. The Bible contains different kinds of such books. Some are history, telling the stories of the Jews, Jesus, or Jesus' followers. Some are collections of wise sayings. Some are God's commands to His people, which He expects them to obey. Some are songs of praise to God. Some are books of prophecy, messages from God that He gave through chosen people called prophets. The Bible is really one great story of salvation. Christian Bibles range from the 66 books of the Protestant canon to 81 books in the Ethiopian Orthodox Bible. 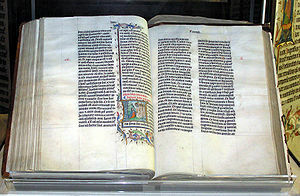 The oldest surviving Christian Bible is the Codex Sinaiticus, a Greek manuscript from the fourth century AD. The oldest complete Hebrew manuscripts date from the Middle Ages. For a long time the texts were passed on by word of mouth from generation to generation. The Bible was written long ago in Hebrew, Aramaic, and Greek, and translations were made later into Latin and some other languages. Now there are translations in English and many other languages. The books of the Hebrew text—what Christians call the Old Testament—were not all written at the same time. It took hundreds of years (about 1200 years). The process of putting it all together began around 400 B.C. The New Testament, which was originally written in Greek, began to be put together in about 100 A.D.
A translation is when a scribe takes the source in one language and writes it in another language. Most texts of the Bible were written in Ancient Greek or in Aramaic. The New Testament was first translated into English in 1525 by William Tyndale. At the time, people did not have their own Bible at home and only heard it read in Latin in churches. He did it even though at the time it was a crime to translate the Bible into English. Another well known translation is the 1611 King James Translation (commonly known as the Authorized King James Version of the Bible). Some texts were written by historians who tried to show what Ancient Israel was like. Other texts are poems about God and his work. And others were used to make laws. Followers of Judaism and Christianity consider the Bible sacred but they do not all agree about what belongs in the Bible. What is considered part of the Bible changed with history. Different denominations include certain parts or leave out other parts. There is not one single version of the Bible; both the content of the books and their order may change. Today there are dozens of versions of the Bible. Some are translations and some are paraphrases. A paraphrased version is where people take a translation and put it in their own words. As the Bible has been translated into modern languages, it is also possible that there are different translations of the same texts. The Bible is the best selling book of all time. 2.5 billion to more than 6 billion copies of the Bible have been sold to date. A complete version of the Bible exists in 471 languages. Parts have been translated in 2225 languages. Most Bibles can be found in the British Museum in London. The Christian Bible is a collection of 66 books. The first 39 books are the Old Testament. It is the first part of the God's story of salvation. "Salvation" is God's long work of saving us from our sins. "Sin" is what happened when people decided to live their own way instead of God's way in the world that God created. That was when God began His great work of saving us from our sins. To prepare the way, God had to destroy the whole world by a great flood, except for the family of Noah. Then God raised up a new people for Himself. They were the ancient Hebrews. God promised the Hebrews they would bring His salvation to the whole world. The first five books of the Old Testament are mostly the story of how God chose the ancient Hebrews and taught them his laws. Following these are the twelve books that tell the history of the Hebrews. The next five are books of poetry and wisdom. One of these five books, the "Psalms", is a book of songs showing mainly how God wants to be worshiped. The last seventeen books of the Old Testament were written by Hebrew prophets. These books tell about God's disappointment with the ancient Hebrews and His promise to bring them back to friendship with Him. The prophets also foretell a great surprise God was planning for the world-He was going to send His very own Son, the Messiah (the "Anointed One"), the Saviour, to save us from our sins. You can read about this Messiah in the New Testament. In the Old Testament, Tanakh was mostly written in Hebrew; a few parts were written in Aramaic. This part of the Bible is considered to be holy by Jews as well as Christians. There are also a few books of the Old Testament's time called Deuterocanonical by those Churches that accept them as part of the Bible, and Apocrypha by those that do not. People have different ideas about the Bible. Christians believe it is God's Word to people. The Jews believe that only the Old Testament is from God. Protestants and Catholics believe that the Old and New Testaments are God's Word. Catholics also believe that the books called Apocrypha or Deuterocanonical are part of the Bible. Sometimes different denominations disagree over exactly what the Bible means. According to Islam, much of the Bible is true, but the Koran is better. Atheists do not believe that gods exist, so the Bible is only an ancient book. Deists believe in God, but they believe that the Bible written by people, so they don't see it as important. ↑ Ash, Russell (2001). Top 10 of Everything 2002. Dorling Kindersley. ISBN 0789480433, 9780789480439 . Entre Galilée et l'Église : la Bible., Une mise au point. Étude. Joël COL. ISBN 2-9520299-0-3, AutoEdition Méguila, 2003. This page was last changed on 21 December 2014, at 11:40.